One thing that struck me about the Association of Oregon Recyclers' Spring Forum, entitled “Reuse Systems and Organizations in Action,” was how incredibly rich the reuse culture in Oregon is. I was impressed by organizations small and large, government and nonprofit—from an organization working with the industrial sector’s manufactured byproducts, to a brother and sister team saving lumber from Oregon’s old barns, to the ReBuilding Center's nonprofit building supplies thrift store working to create sustainable communities. Sara Eddie, who does Business Development at RBC, attended the conference and shared this sentiment, saying, “Oregon seems to be a leader in pioneering, innovative reuse efforts. In addition to DEQ's reuse grant program and being the first state to have a city mandatory deconstruction program, I was especially impressed with the refillable bottle program, the Library of Things, and Renewal Workshop.” Here are some recaps of the presentations highlighting Oregon's most vibrant and exciting waste reduction and reuse efforts. ResourceFULL Use works with manufactured byproducts based on the Swedish concept of Kulundborg, a resource exchange for materials that come out of the industrial sector. The organization facilitates and builds relationships between businesses to create symbiosis. They find one business that has too much of one byproduct and finds another business who may need it. They facilitate reuse tactics through workshops and networking. ResourceFULL Use described some of the more bizarre waste product exchanges. For instance, they connected a chicken farmer with tons of feathers with a fiberglass company that used the feathers in their fiberglass to strengthen the overall product. They see materials as possessing a lot of embedded energy and reuse and repurposing as hugely better than recycling. As materials move from raw materials to processing and then consumption, they take on more and more embedded energy. Plus, less consumption leads to more money in your pockets and increased environmental benefits such as greenhouse gas reduction. She spoke about downstream impacts like leaks, emissions, and the environmental cost of transporting goods. Another example of a relationship her company has been able to establish was with Tillamook County and SCRAP. Tillamook had a bunch of reflective signs that artists and educators at SCRAP’s reusable art supply store were able to turn into creative projects. This relationship saved 1,350 pounds of material, which resulted in 1,710 less pounds of greenhouse gases released into the atmosphere. She ended her talk with a call for anyone who might have use for mylar, a material that a lot of coffee and beer brewers use as well as high tech companies. Any chance you have any ideas? The ReBuilding Center wrote a blog article a couple weeks ago about the Library of Things happening at the Hillsboro Public Library. Brandan Lax explains that libraries lending out non-traditional items is not a new thing. He began selecting and purchasing items for their collection, like A/V equipment and games, about three years ago, and then slowly started expanding their collection of now 430 things and 350 board games (the largest collection of board games in the United States). He started adding in things like cake pans and robotic Arduino kits, testing to see how the items were returned. The trial was successful and fit in with the library's values of promoting lifelong experiential learning. He points out that in this day and age, anyone can YouTube a subject and learn how to do almost anything. The only thing that’s missing is the actual item. That’s where the Hillsboro Library of Things comes in. Want to try out canning and see if it becomes a new hobby? Check it out with your library card! Their tagline says it all: “Check out an experience.” Today, the Hillsboro Library has supplied 17,342 checkouts of things and 14,844 checkouts of board games. At any given time, 90% of all the items are on hold or in use. Some items, like the ice cream maker, aren’t made to be running day-in-day-out, but if it dies after 50 uses, Brandan sees that as a success because the item is being used to its fullest extent. With your Hillsboro library card, you can check any of these items out for seven days at a time. They consciously did not make late, cleaning, or fixing fees very high, starting with a $1/day late fee and $5 cleaning or servicing fee. The Hillsboro Library of things has been excellent at promoting lesser used items like their chimney sweep kit with their social media and fun videos. Brandan has high hopes that Washington County will get their own Library of Things. He says that not only are libraries really good and experienced at “checking things out,” but they also have the volunteers, resources, and space built in to do it. Our very own Tom Patzkowski, ReBuilding Center Store Manager, gave a passionate and rousing speech about humans' interconnectedness. He illustrated how the ReBuilding Center not only recognizes the potential of materials, but the great potential in people. He also spoke about how our “thrift store for building supplies” places great value on the history of the materials. Pacific Northwest old-growth lumber, for example, took years to grow into giants, then were harvested, then built into some of Portland’s older structures, which RBC is fortunate enough to salvage and give new life. He pointed out how the exactly right conditions came together to bring us the beautiful wood that you can find in the store’s lumberyard: salmon soaked up nitrogen during their travels in the ocean, eventually offered their bodies, creating the perfect conditions for the soil at the end of the streams they traveled up to spawn. “We’re harvesting our cities, not our forests,” Tom said. Many people throughout the conference made comments about how motivational Tom's speech was and how they liked how strongly linked community and reuse can be. As Tom said, "you can’t have one without the other." Tom and the ReBuilding Center believe in changing the way we operate to become more equitable and sustainable, recognizing the power and benefit of reusing materials (that would have otherwise been thrown away), and sustainability’s undeniable connection to community. Did you know that there are 800 billion tons of natural resources in our built environment worldwide? Shawn Wood, who works for the City in their Bureau of Planning and Sustainability (BPS) division, is working to turn those liabilities into assets. 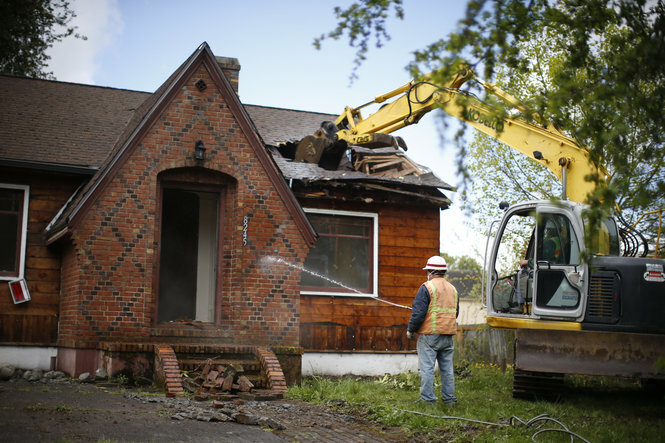 In Portland, there are 300+ homes that were torn down in the last year, with over half a million square feet of material. Shawn sets the stage by describing the perceived benefits of demolition versus deconstruction; demolition takes a couple of days, a couple of people, and is relatively cheap and fast. Sometimes when a house comes down they are met with an assembly of angry protesters, toting “Stop Demolishing Portland” signs. People are angry that these buildings are being smashed to a pulp and sent to the landfill through mechanized demolition. This is where deconstruction firms come in—they believe that if a house must come down, that it should be carefully “un-built,” salvaging the component parts for reuse. Portland is leading the charge in this field, nationwide, as the first city in the U.S. to create a deconstruction ordinance. The ordinance requires all structures built before 1916 to be deconstructed rather than demolished. Why 1916? The answer lies in supply and demand. Shawn and his team at BPS want to be careful to not introduce too many materials that the market wouldn't be able to handle. Since the ordinance went into effect, 31% of homes are now being deconstructed and there are more firms than ever. Before moving that date up, the City is introducing yet another ground-breaking ordinance: that all lead or asbestos-containing materials (such as windows, doors, lead-painted siding) must be removed before mechanized demolition of any structure, regardless of the year it was built. The plan is to see how that goes, how contractors respond, and how busy they get removing all of those items. Outside of deconstruction’s relevant environmental and public health benefits, deconstruction also creates jobs. BPS has trained over 30 people in the deconstruction field with preference to people of color, women, and other marginalized groups. The training they held was over half women. Portland’s making waves, or as Shawn points out, maybe they are more like growth rings. Did you know that if you volunteer for 24 hours, you are eligible for a free refurbished computer? Free Geek has been around for 18 years now, offering classes, volunteer opportunities, and a place to donate and buy electronics. Lean helped them set up stations that were far more efficient, even creating a “learning board” so that interns could consult an illustrated diagram of a circuit board when they were unsure about the intricacies of one of their projects. One system Lean helped implement was a wayfinding system, using colored tape on the floor that directed people to where they needed to go within their labyrinthine building. Lean and Free Geek identified problems as opportunities. When they set a goal of doubling the number of laptops they were able to service, without extra staffing or a “factory-like” environment that still provided fun learning experiences for their volunteers, they found a simple solution. They looked at their inventory and at the things they had too much of or weren’t turning over quickly enough. They decided to only fix things according to need. For instance, they discovered there wasn’t much need for 10 VHS players, so they decided to only take, repair, and stock as many as they could sell, thus freeing them up to repair more laptops. They also streamlined systems, saving space and time. Now Free Geek will take the work that Lean helped them develop and will continue to track issues and implement improvements! Reuse retail is no stranger to a little disorder. We are basically organizing the city’s junk drawers and garages. Mike Alfoni walks us through a Lean process “from hardware to easyware” outlining some key steps to getting things in order: get clear, get organized, and get moving. His presentation focused on the trials and tribulations of the ReBuilding Center's miscellaneous hardware section. The process goes like this. Get clear: agree on the situation and the solution. Get organized: set a plan. Then get moving: implement with minimal prototypes. Then do it again! Get clear: test and get feedback. Get organized: revise the system. Get moving: implement minimal changes. When you’re working with inventory of greatly different types, quantities, qualities of materials that aren’t labeled; that arrive at unpredictable times and are handled by unpredictable volunteer labor, it’s important to start small, show the team success, and sustain the process improvements. One young woman during the comments section stood up and said, “I think you’re my spirit animal. Everyone in reuse retail knows how messy it can get and I appreciate your honesty.” The big takeaway from Mike was that it’s important to work as a team, to get clear, organized, and moving together. Without staff buy-in, you won't have consistent use of the system, so make sure to get all parties involved early and do it together! Nicole Bassett from The Renewal Workshop spoke about how their company set out to solve hard problems and create new systems to "divert clothing and textiles from the landfill and make them into renewed apparel, upcycled materials, and recyclable feedstock." Renewal Workshop works with some big brands, has an online shop, and occasionally you may be able to catch one of their pop-up shops. Rachel Browning from Salvage Works spoke about the origins of her and her brother’s business salvaging beautiful old-growth lumber with loads of patina from Oregon’s barns and other architecture. Forest Endicott, who grew up with deconstruction (over demolition) as the norm, spoke about his experience growing up as the son of ReBuilding Center’s founder, Shane Endicott, basically born with a nail puller in his hand. He has now set out on his own business venture in response to the new ordinance, NW Deconstruction. Kelly Caldwell from ReClaim It! talked about their programs such as Glean, a Metro partnership connecting artists with materials from the landfill, their storefront on N Killingworth that salvages materials from the Metro Transfer Station, and about a couple of exciting events coming up including their 19th Annual Reuse Art Show on August 14-15 at McMenamins Edgefield where artists and makers will be showcasing all kinds of creative upcycled creations! All in all, the conference reflected what a vibrant and progressive reuse culture we have here in Portland—a place where passionate people come together to try to solve issues around waste reduction in creative ways.